Welcome to the world of railway signalling! SimSig brings the signal box to your home PC and with it the enjoyment and frustrations of running today's (and some of yesterday's) railways. How often has your train been delayed because of "signal failure" and you've wondered why trains can't be routed around the problem - or why it is even a problem in the first place? You'll soon see exactly why - with SimSig! SimSig puts you in the seat of a signaller, also called a Dispatcher or Network Control Officer, operating signalling screens based on the widely used IECC and Westcad graphics used in the UK. 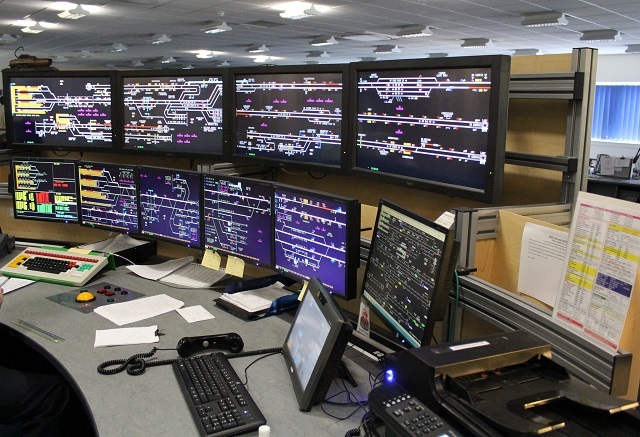 That is, you operate the signals and points/switches in order to get trains to their destinations on time. SimSig has a wide range of areas you can operate including large portions of the UK, a small US simulation, and a couple of Australian areas. Each has its own challenges and skill level, the latter ranging from easy to mentally complicated. A desk in Edinburgh Signalling Centre - Glasgow Queen Street area. Used with permission from Andrew Gardiner. 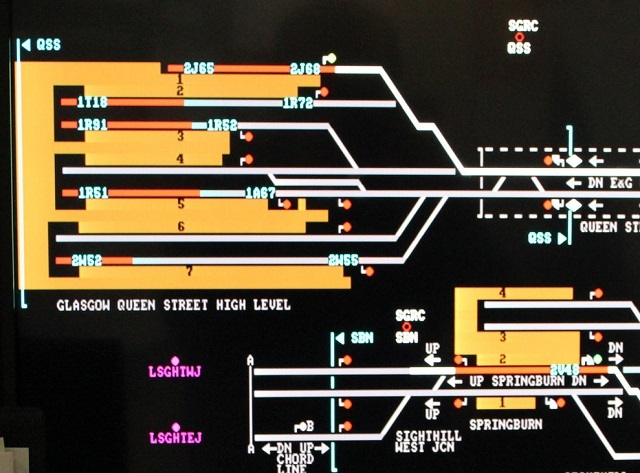 A signalling screen in Edinburgh Signalling Centre - Glasgow Queen Street. User oriented - tell us what you want, we'll try to produce it! SimSig runs on Windows 7, 8.0, 8.1, and 10. SimSig also runs on emulators such as Wine for Linux and Crossover for Mac. This is not guaranteed but we try to keep such emulators supported. Tablets and phones are not supported. You can peruse prices in our Shop but we have several free simulations, then range from under £10 upwards, depending on the complexity of the simulation. All simulations come with an evaluation period so you can try before you buy. Yes! Many of our simulations are suitable for multiplayer. The larger simulations have as many as nine positions keeping people busy. But many simulations also have optional automation such as ARS (Automatic Route Setting) which means you can run a larger simulation by yourself. Multiplayer works over the Internet, or your home LAN. One person acts as the host while others connect with an IP address and port number. We have run multiplayers across the world with members in the UK, the US, Australia, Europe, and elsewhere. Many simulations can be "chained", which is where adjacent areas can be linked together to form a larger area. Unlike other products, anybody can write a timetable using the in-built timetable editor. We also do not charge for extra timetables. Our files area has plenty of user-contributed timetables to download. Sorry, users cannot produce simulations themselves. Here we have the free Liverpool Street simulation running. ARS (automatic route setting) is setting the routes but we can easily take over. The eighteen platforms at Liverpool Street in London are very busy during the morning rush hour that we see here. The blue four-character labels are the train descriptions (like a flight number) such as 2H07. The signaller can identify the routing and destination of the train from that train description. The flashing white blobs indicate that a train is ready to depart. White lines show route set for trains, while you can see the signals showing red (stop), yellow (caution), double yellow (preliminary caution), or green. This animated GIF is running at approximately 4x normal speed.